Elastic Drums wins ANR Sonic Joy Awards 2017 !! The basic idea for Elastic Drums was, to create an easy and fun in handling drum app, with a genuine sound, an instrument with its own character. Elastic Drums works with drum synth modeling, so the the drum sounds are much more „elastic“ compared to the use of samples, most drum apps do so far. 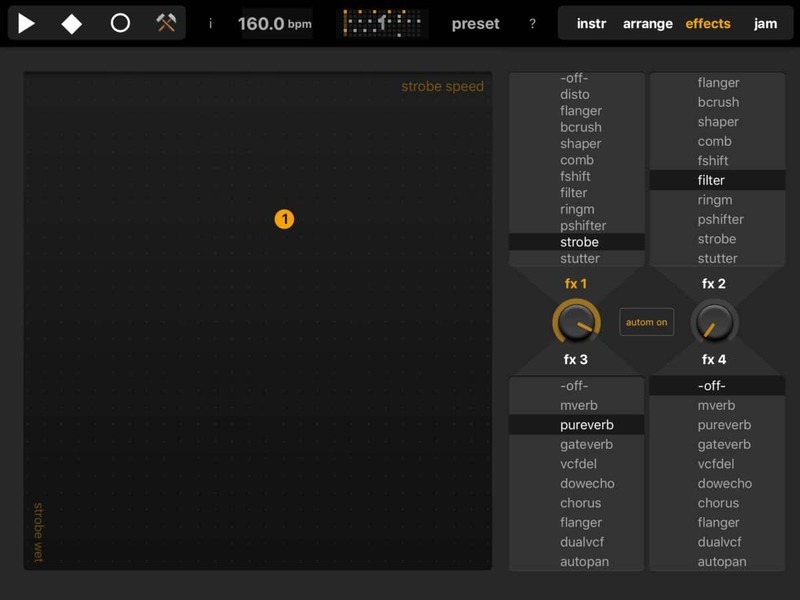 The sounds can be changed drastically and combined with a very flexible effect section Elastic Drums can be even a tool for sounddesign, not only for creating beats. Analog originals would be the Korg Electribes for their ease of use handling and the recoding of parameters and Elektron Machine for it’s concept to have different switchable drum synth models for every sequencer channel. Elastic Drums is designed and developed by Oliver Greschke, with contributions to Pure Data patching by Matt Davey. Graphic design by Carsten Schneider. Elastic Drums is published by MoMinstruments. It’s one of the most successful drum apps in the iTunes store! 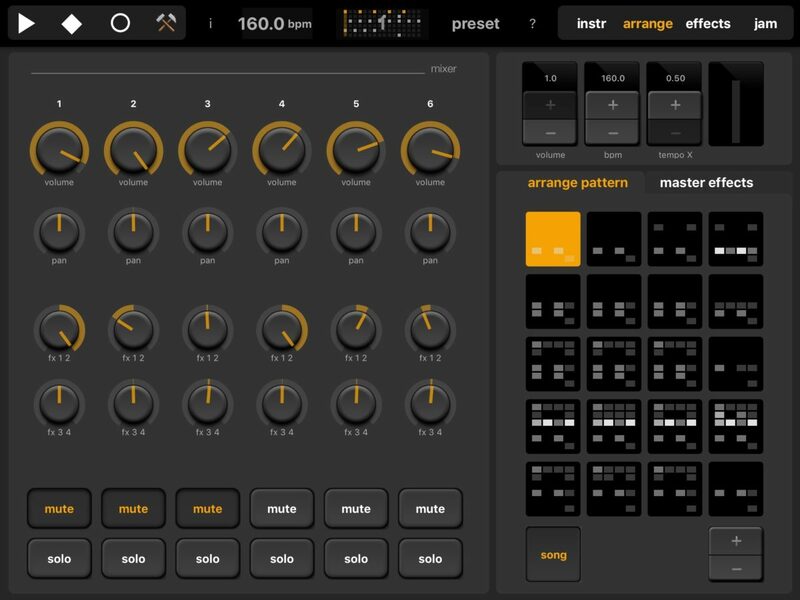 Elastic Drums is an iOS app with 6 channels of synthesized sounds, a step sequencer and 4 effect channels, all tweak-able in an elastic way. 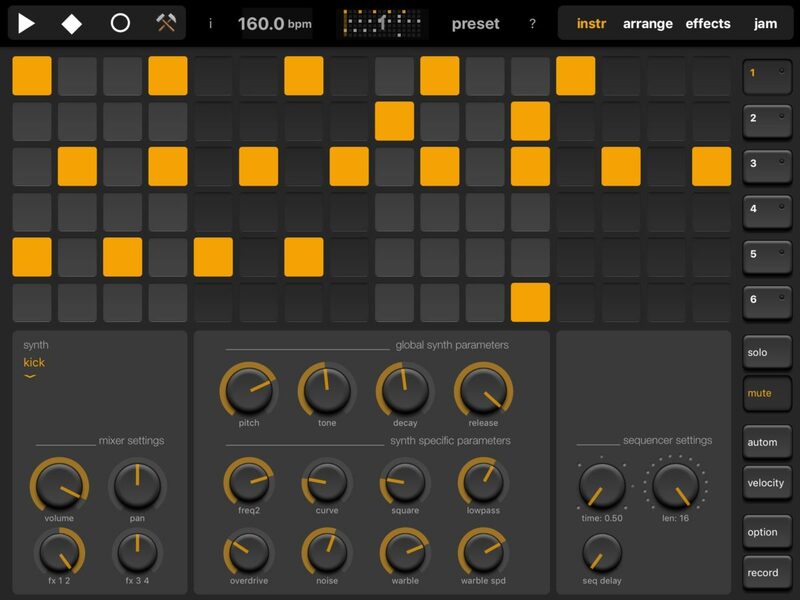 I want to use ElasticDrums with an external sequencer. Thus I mapped the MIDI notes to the tracks, which works fine. My problem now is that while the sequencer is playing the beat, the track selection changes continuously which makes it impossible to make changes to the sound (select different synth, turning the knobs, setup the velocity, …) while the beat is playing. How could I achieve this? Do you already have an estimate when “hopefully soon” could be? With the next update, but this might take 4,5 weeks to be realistic. hey, it’s greg here, longtime user of the app. love it! 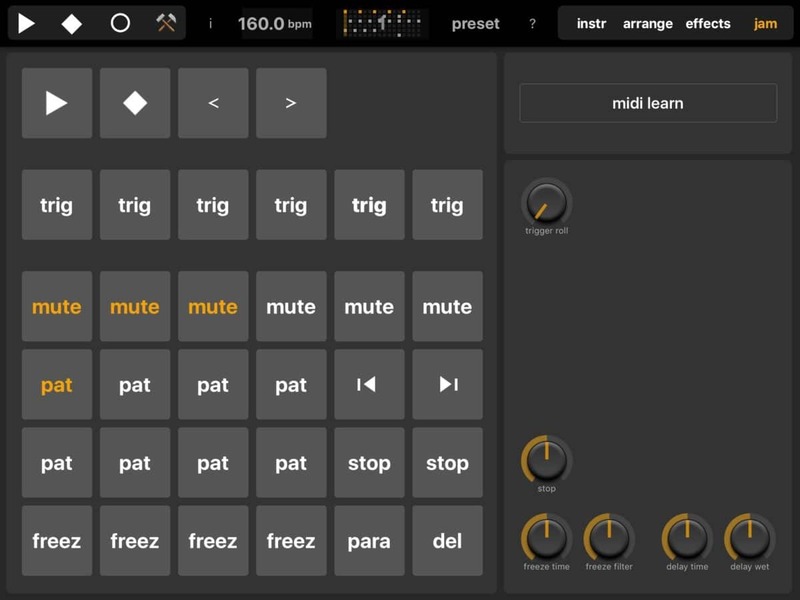 what do you think are some good midi controllers to use with the app? any recommendations greatly appreciated. keep up the good work! Hello! I love the app and am trying to control it with the Korg Nankontrol 2, but when I plug it in with the USB to lightning adapter I get an error saying the device is not supported. I’m running IOS 12 on an iPad mini 4. Do you think it’s the cable? It will connect, but only for a minute at a time, then disconnects. Any ideas? This has nothing much to do with Elastic Drums, but rather with your external gear. Maybe try another (Apple original) cable. Good luck! Hi, I’ve been enjoying the App. There’s only one problem I’ve been having, which is that on Midi Encoders, the Elastic Drums doesn’t take in the relative setting properly. When I set my encoders that way, the knobs in Elastic Drums only alternate between two values, and not a subtraction on the current value. Is this how it is supposed to work? I have an Arturia MiniLAB MKII, and my plan was originally to use it to control all of the knobs on each instrument while I messed with other things in other apps. So, I have the “Same controller for all instr” turned on. Hello i have this app for quite a long Time on my iPad.i don’t count the number of loops & samples i made for my hardware sampler & arrived on a Finished track with it.but please i dream on using it on my Android phone on the go. I don’t wanna buy an iPhone anymore. Please consider an Android version because since version 7 or 8 realtime performance were really improved. Thanks for your hard work. In Elastic Drums, can you set the frequency of a kick (sine wave) by the note value like G2 or by hertz like 52 hertz so that the kicks can be “tuned” to the key of the song? Thanks and congratilations on this app!